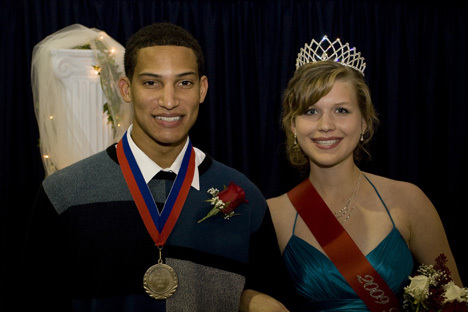 Liesl Nauck was crowned the 2009-2010 Homecoming Queen during the Homecoming Coronation on Friday evening, November 6, and Adam Potts was named Homecoming King. Nauck is an elementary education major from Andover, KS, and Potts is a physical education major from Canton, MO. Other queen candidates were seniors Janelle McGinniss from Kansas City, MO; Rebekah Baumann from St. Louis, MO; and Anya Demidchik from Orsha, Belarus. King candidates were seniors Kevin Campbell from Troy, MO; Glenn McCrea from Muscatine, IA; and Ryan Stark from Quincy, IL. It was a beautiful morning Saturday, November 7, for the annual Trojan Turkey Trek. Ryan Constable was the first-place winner with a time of 18:00, and the overall female winner was Carrie Noland with a time of 22:54. Overall male HLG alumni winner was Peter Hokanson (21:22), and the overall female HLG alumni winner was Emily Ver Meer (24:54). Other Homecoming events included an alumni golf tournament, alumni brunch, a president’s reception, alumni art exhibit, entertainment by comedians Bean and Bailey, a swim meet, and men’s and women’s soccer. The weekend ended with women’s basketball against Missouri Valley and men’s basketball against Graceland College. Between games the Homecoming King, Queen and candidates were introduced. The HLG Cheerleaders performed at half-time of the men’s game. Mark your calendars for HLG Homecoming 2010 which is set for November 5-6.